Eminent Victorian Chess-Players, published by McFarland, is a major work on British chess history focusing on some of its leading personalities, and their lives, milieu, struggles and achievements. Several reviews for this book are available. All were strongly positive. 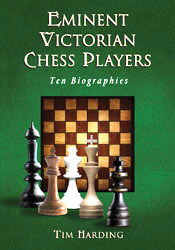 Eminent Victorian Chess-Players consists of ten essays in historical biography about leading figures in British chess (amateur and professional) during the 19th century. All chapters have some games and pictorial illustrations. This large book begins with new revelations about Captain Evans, inventor of the Evans gambit, and ends with a chapter on the curious career of Isidor Gunsberg, the Hungarian-born Briish grandmaster who was Steinitz's third opponent in world championship matches. I have also written shorter articles about both those men, together with a profile of the lady champion Mary Rudge, for the Oxford Dictionary of National Biography. These were added to its online edition in May 2012. Eminent Victorian Chess-Players also includes major reassessments of several other players including Howard Staunton, Henry Bird, and William Steinitz. One chapter is about Joseph Henry Blackburne, about whom I have now written a full-length game collection and biography. Many chapters are full of human interest, delving into aspects of player's careers that have rarely been discussed in chess books. This includes an investigation into the secret life of one of the "fighting reverends" of Victorian chess, the Rev. Arthur Skipworth. The other chapters in the book feature Burn, Löwenthal and Zukertort. Chapters include career summaries and personal notes on several other players tangential to the lives of the main ten, including Ernst Falkbeer, Daniel Harrwitz, Leopold Hoffer, the Rev. George Alcock MacDonnell, and Adolphus Zytogorski. Through these overlapping stories, a new picture of nineteenth century chess emerges. The game selection is a mixture of classics and little-known games that have never been republished until now. Many factual inaccuracies in previous chess history books and reference works are corrected along the way. Appendices of further interest include the career records of all ten eminences, the known games by Captain Evans, and a bonus article on the chess "automaton" Mephisto. There is also a full transcript of Howard Staunton's contract with Routledge & Co., for his edition of William Shakespeare's works, which is an important document in view of the reasons he gave for not playing a match with Morphy with 1858. The author acknowledges the special assistance of Canadian mathematics professor Dr. Rod Edwards in compiling the career statistics and calculating estimated historical records of the players concerned. More details about the book and its table of contents can be found on this page. For fun, here are ten questions. Do you know all the answers already? If not, you certainly need to read this book.